The end of this week marked a milestone in activity for VELLUM. Never have we been more occupied with sales, events, and promotion than now. Nothing about wine is easy, whether it be its creation, message or assuring a bottle's final destination. We must be concerned with every detail. People seem to think that we came out of nowhere and introduced VELLUM Cabernet Sauvignon. We had no previous attachment to a winery legacy nor was any land or label model handed down to us. And! We are not doctors or lawyers looking to find new ways to entertain friends. So to many, it is a mystery! In truth, Jeff and I have been in the background of the wine industry honing our skills. Jeff has developed a lifetime of business knowledge around agriculture and I have been creating wines for others and dreaming of my own. The answer to how we started is that we believe in ourselves, in each other and in turn everyone else believed in us. We have a shared love of wine as do all of the people we come in contact with everyday. The difference is that we maintain wine as art, history and culture. Almost a mantra - - and out of it VELLUM was born. What is in the bottle is a representation of what is in our hearts and minds. It is the past respected, knowledge gained and balance actualized. That is our love. From a distant land the following was sent to me. As for the how and why, I like to think that it sums up everything we at Vellum Wine Craft have been doing with our time here. You know that dream you carry around with you each day? Wasn't it what you were put on planet Earth to do? They say everyone has a calling, can you still hear it? Doesn't it eat away at you? That treadmill you are on, did it ever get too much? Did you ever wonder what it would be like to do your thing? Did you ever feel time was passing you by? Just how many days have you left before your last? Did you ever wonder about stuff like that? You will be too old. Too young. Too something or other. Did you remember how alive it made you feel? It's not called a leap of faith for nothing. It's not too late, honest. In the end, this is how great wine gets made. This week I hit the Northern Sonoma County Wine Road www.wineroad.com. Once a year, wineries from the Alexander, Dry Creek and Russian River Valleys open their doors to the public for barrel tasting. It is a great event spanning two weekends in March for the public to go out to Sonoma County wineries, meet the winemakers and taste the current vintage in barrel. I had a wonderful time touring the countyside with friends and even though there are over 160 wineries to choose from, we were able to visit only four. Each winery has several barrels to taste and you will want to try all of them! If you attempt the Wine Road barrel tasting pace yourself, the pours are generous and remember to bring along a designated driver! Notably in my day out, I want to mention one winery in particular that has reached legendary status spanning four decades -- Joseph Swan Vineyards. Founded by Joe Swan, this estate winery has had more notable vintages I know of than any other its size. Focusing on Zinfandel and Pinot Noir, the winery has always maintained that "small was beautiful"; where carefully tended vineyards could be maintained by one person and this led to more intense and age-worthy wines. Some time ago I learned this from my mentor Dr. Jerry Seps at Storybook Mountain Vineyards and he learned it from his mentor Joe Swan over 35 years ago. It is a philosophy that VELLUM will always admire and pursue and it is a privilege to carry on such a tradition. 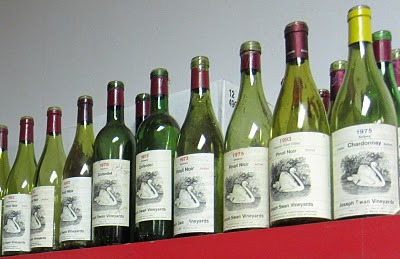 If you can get a hold of the old wines of Joseph Swan Vineyards please do. I hear that they are very much alive! It was a pleasure barrel tasting there and I want extend the invitation to any who want to share a similar experience with us!